It’s 6am in Shanghai, and I've been woken up by the group of elderly women exercising and gossiping on the communal exercise equipment in my lane. Again. They're my human alarm clock. I get dressed and head out into the hot and steamy September day. 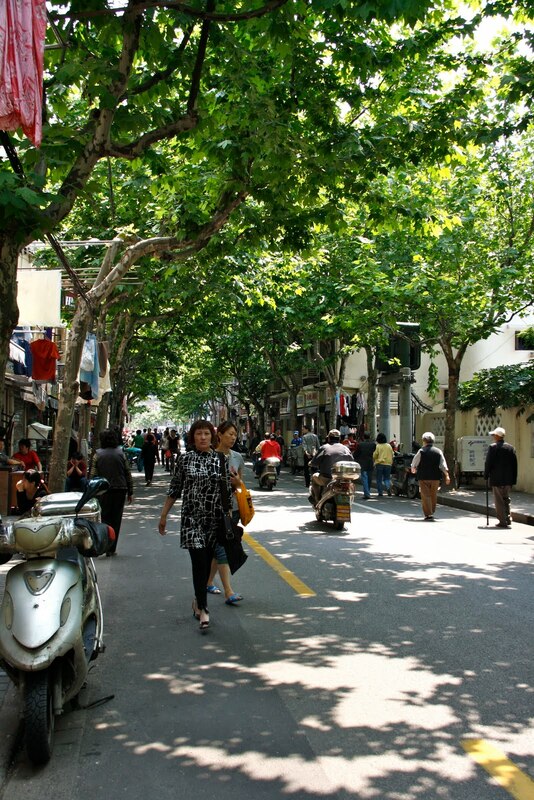 The cicadas have already begun humming loudly in the leafy green French plane trees lining my street, Nanchang Lu, and as I pass the corner shop there is an emerald green cricket singing loudly in his exquisitely tiny bamboo cage, hung above the doorway. He stops as he senses my approach, and starts up again in full chirruping song as soon as I’ve passed. 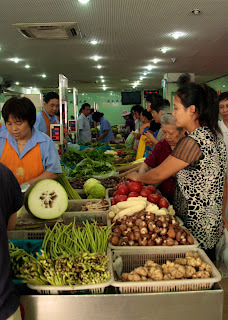 I'm heading to the wet market - the noisy, colourful Chinese version of the supermarket, to buy food for dinner. It's part of my daily life now. The food vendors are already busy outside the wet market entrance, where a crowd is building. The walnuts arrived this week from distant Xinjiang, in far-west China, and the man selling them from two large wire panniers balanced on each side of his bicycle wears a crisp white cap. Next to him Chicken Lady is selling live chickens, ducks and pigeons from a 6-storey cage strapped tightly to the back of her tricycle. 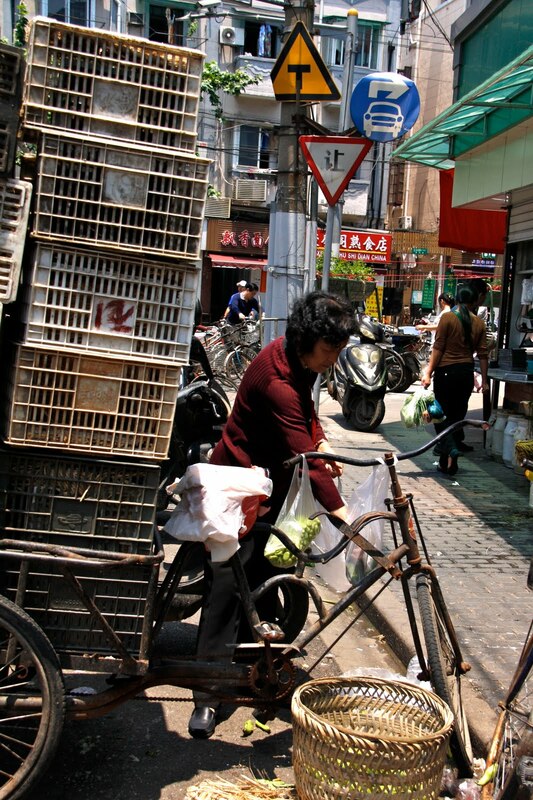 Later, as she cycles away with the unsold birds, the cages, way taller than her head, lean precariously to the left and all the chickens sqwawk and try to stand up, feathers flying everywhere. A lady in her pyjamas, holding a chicken upside down by its feet, walks towards home. Early morning is the best time to come shopping, when the produce is freshest and the choice is best. I go inside the market, making my way through the tangle of bicycles, and the buzz of hundreds of voices fills my ears with snatches of ‘fresh today!’ ‘best quality!’ and ‘good price!’ filtering through the noisy hum of Shanghainese dialect. 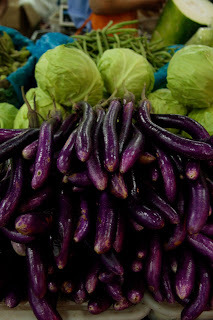 At the first row of stalls the customers are three deep, and through their elbows I can see a pile of glistening deep purple Chinese eggplants, long and slim; a basket of shiitake mushrooms so fresh there is still moist earth clinging to their stems, and bundles of sinuous green snakebeans. The second row of stalls is lined with woven baskets filled with Chinese leeks, mountains of fresh ginger, pale green bamboo shoots and tender baby bok choy so fresh it was born only a few hours ago. Strange misshapen dirt-coloured lumps catch my eye - they are lily bulbs, in season right now, and when cleaned they can be separated into small white petals and stir fried with a little garlic and celery. 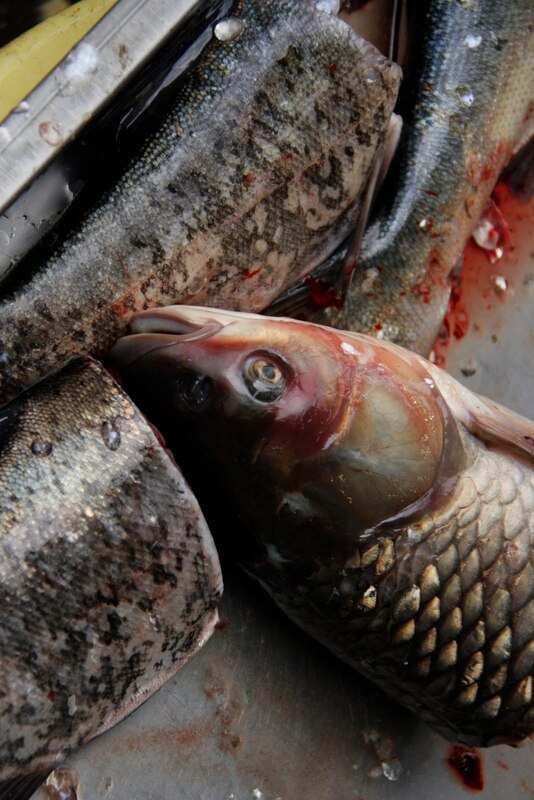 They have a tender and delicate flavour. I buy a handful, and choose some eggplants and a bunch of fresh greens. The last row of stalls is lined with fish tanks filled with flapping fish, tubs of slithering eels, and net bags full of bullfrogs and crabs. 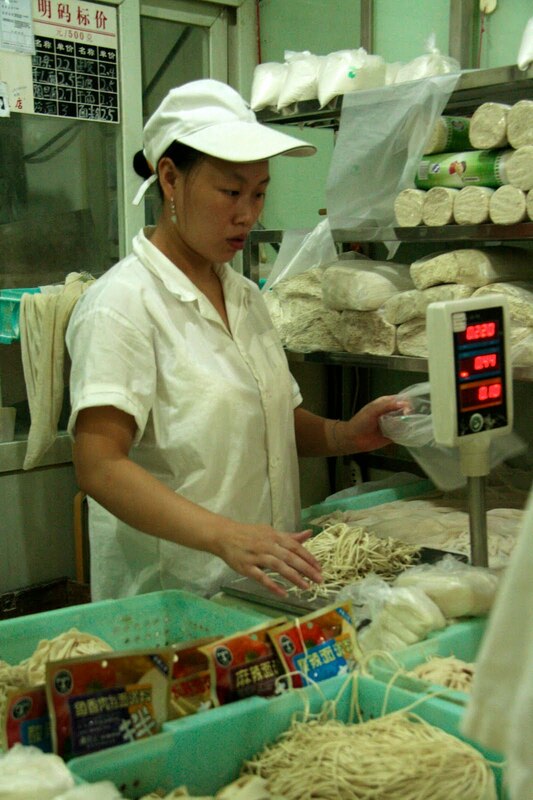 The smell is strong, salty, and quite unpleasant, so I move off to the side where the noodle seller and his wife, covered in a fine layer of white flour, hand me a stack of dumpling skins and a tangle of fresh-made noodles to take home. Dinner sorted in ten short minutes, and way more interesting than the aisles of a supermarket. I arrived in Shanghai over a year ago now, with no real idea of what I had gotten myself into. I came here for my husband’s work, along with our two daughters, initially unwilling participants but now full-blown 'old china hands'. Accustomed to the intensity of my work as an ER doctor, I suddenly found myself with more free time on my hands than I'd had since I was a kid. I had only a single resolve - I wanted to write a blog, to document the incredible and colourful life around me, and I wanted to concentrate on people and food, always so inextricably intertwined in my life. Along the way I rekindled an old passion – photography, and learnt to really enjoy writing, and as I wrote I began to understand a little of this intriguing place in which I found myself. 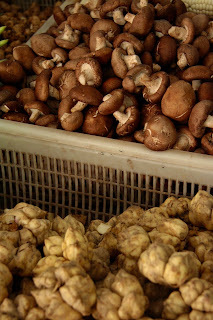 So much of life in China orbits around the national obsession - food. When you read my blog I want you to imagine you are here in Shanghai, right at my elbow, bargaining over the price of a plump catfish, or hovering at the kitchen doorway working out exactly how that dish is cooked. Think of yourself as a culinary anthropologist, discovering new places and foods without ever having to leave home. I will be your eyes, your ears, (thankfully not your nose) as you discover what life is really like inside China, and what they eat here. People. Food. Life. That’s it. 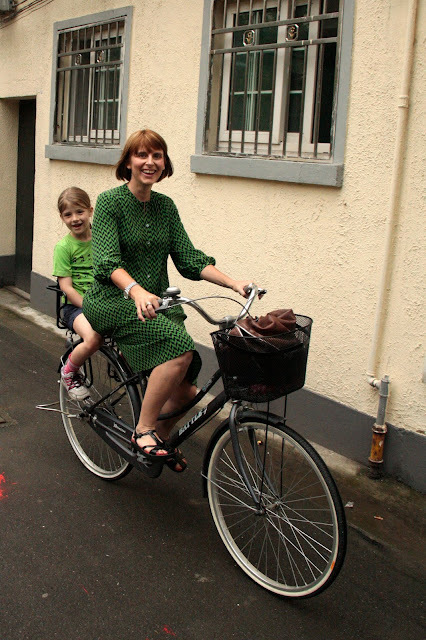 I hope you enjoy your little slice of life in Shanghai with me! This is my first entry for Project Food Blog, an incredibly fun competition involving two thousand food bloggers from all over the world and weekly knockout challenges. They're looking for the next food blog star! You can vote (for me! for me!) by clicking on the link below and signing in. I'll keep you posted about how it goes....!